The new Shazam! trailer dropped a subtle reference to Captain Marvel. Shazam may be only making his way to the big screen in 2019 but is one of the oldest superheroes in comics, created by artist C.C. Beck and writer Bill Parker back in 1939. Back when he debuted, though, Billy Batson's superhero went under the codename "Captain Marvel." He was the most popular superhero of the 1940s, with Fawcett Comics expanding his mythology to include a whole range of Marvel-ous heroes. DC Comics licensed the Marvel Family characters from Fawcett in 1972, but due to a trademark dispute with Marvel Comics they ditched the "Captain Marvel" name. DC has since branded and marketed the characters under the trademark "Shazam!," and in 2011 they decided to rename the hero completely. That's why 2019 is amusingly starting off with Marvel's Captain Marvel and DC's Shazam! There's a lot of confusion and controversy among elements of the respective fanbases to this day, but the stars of the two films don't seem too concerned. That doesn't mean the films can't subtly poke fun at each other, though. 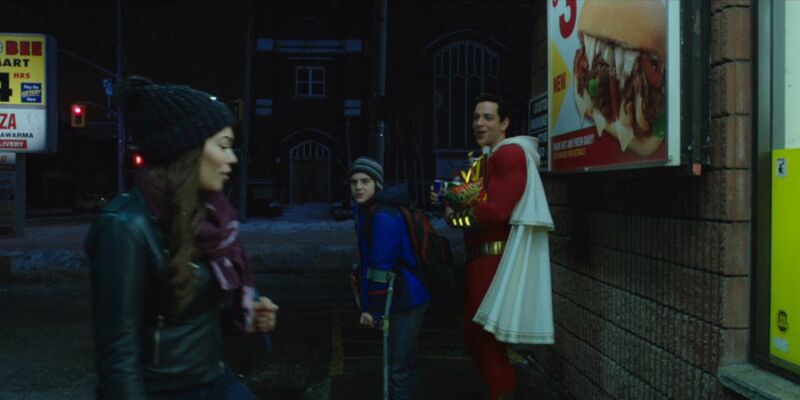 Shazam!, in particular, looks set to be something of a comedy superhero film, and in the new trailer Billy Batson's friend Freddy gives him the hilarious codename "Captain Sparklefingers." Needless to say, Billy isn't impressed, not least because Freddy's just said that to an attractive girl. But there's an additional layer of humor to this line of dialogue. Back in 2012, comic book writer Kelly Sue DeConnick launched a new series starring Carol Danvers, in which she took up the name "Captain Marvel" in honor of a fallen Kree hero. In Captain Marvel #6, Carol was forced to revisit her own past alongside an old friend, Dr. Helen Cobb, and they watched her origin story play out before their eyes. "The scrap they dug up in Peru was from that [machine]," Helen realized, "So it goes boom, you wish you were powerful enough to stop it and bingo! You're Princess Sparklefists, flyin' without a plane?" Yes, with its "Sparklefingers" nod, the Shazam! trailer actually includes a Carol Danvers Easter egg. The more you look into this reference, though, the more amusing it becomes. Marvel's upcoming blockbuster, Captain Marvel, is largely inspired by the Kelly Sue DeConnick run. What's more, an official MCU tie-in novel - Steve Behling's Starforce on the Rise - even made the "Sparklefists" name part of the MCU. Carol Danvers didn't really fit in all that well with the Kree Starforce, and one of her fellow soldiers, Minn-Erva, gave her the irritating nickname. It wouldn't be a surprise to see it turn up in the film as well.